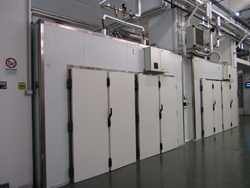 Great news is expected for the pasta-making factories, thanks to the new, more efficient software for a smooth drying process in static cell. This new system differs from the previous ones as it is based on an auto-adjustment principle. Once set start and end phases, during the intermediate phases the software enables the recipe to adjust to each situation and ambient condition. This way, its functioning can be easily adapted to new events, such as human errors or malfunctioning (e.g. 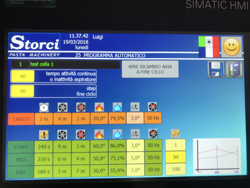 a different humidity level inside the cell or a quantity of pasta different from the standard one), both during the drying and production phases. The convenience of this system consists of a simpler control of the recipes, thanks to the fact that only the beginning and the end of the process must be set. Consequently, the quantity of parameters to be set is reduced as it is the probability to make mistakes. Moreover, you can manage a wide range of pasta shapes with a unique recipe, whereas in the past each shape required a specific recipe. All this results in a greater precision of the product drying level and perfect stability during each step of the process, obtaining a top-notch dry pasta, according to users’ requirements. Our software has already been very successfully tested by several Customers.